Sony has announced their competitor to Panasonic’s AF100 which has brought the video industry to a new point. We now have a selection of large sensor video cameras under $10k. Since the Sony PMW-F3K and RED cameras are out of the budget of most independent production companies or filmmakers, let’s focus on Panasonic, Sony and the current DSLR lineup. 2010 was considered by many to be the year of the HDSLR. Canon, Nikon, Panasonic and Sony all had their models to pick from. Canon jumped ahead of the rest with the popularity of the 5D MkII and subsequent models like the 7D and T2i. Panasonic also took a good chunk of the market with their GH1. 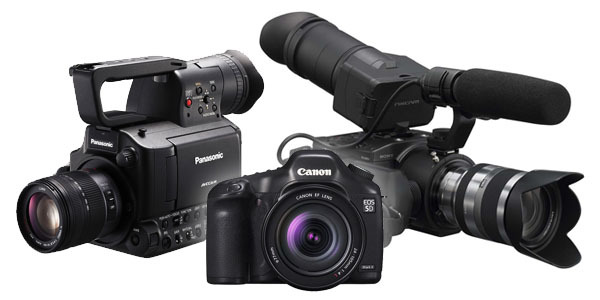 At NAB 2010 we saw every manufacturer and their brother making new gear for DSLR shooters. But what surprised many was Panasonic’s announcement about their AF100. Finally a large sensor camera that had the features of a standard professional video camera. Could it be that camera manufacturers were actually listening to the cries of filmmakers? Many wondered if the HDSLR revolution was over. The AF100 was released and reviews started pouring in. The overall feedback was very positive. The AF100 had features that video shooters had been missing on DSLRs: built in ND filters, viewscreen with zebras, peaking, etc., XLR inputs, HD/SDI output, etc. But it still wasn’t the “perfect” camera. It didn’t have the best codec for intense color correction. The lens choices for micro four thirds were somewhat lacking and due to its 2x crop factor, any lenses you used from other cameras would lose half their field of view. People were spoiled by the full frame sensor of the 5D MkII and even the 1.6 crop of the 7D. Rumors floated around Twitter about a little brother to Sony’s PMW-F3K. Then it was confirmed, but Sony still kept a tight seal on it. 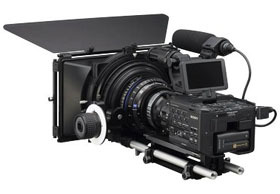 Finally we found out over the past few days the full details of the FS100. Using the same Super 35mm sensor of the F3K, the FS100 looked to be a great option. The body was designed to be very modular, able to go from small and discrete to fully kitted out. This is something DSLR shooters have become very accustomed to. Also the camera demonstrated high sensitivity and very solid image quality with low noise. But upon closer examination, we see how it is limited as to not compete too much with the F3K. Lacking built in ND filters and HD/SDI output is a potential drawback. The build quality has been questioned in some reviews. So again, we see another option that fails to be the “perfect” camera. Perfection is obviously too lofty of an expectation, but getting a high value to the amount you’ve invested isn’t. The question becomes, are these cameras worth the premium price over the DSLR you now use? Before you start looking at charts, spec sheets and sample videos, the first question you should ask yourself is: what is your application? Are you creating content that will be mainly consumed on DVD, internet or local television? Chances are it will be shown in SD. But even if it is in HD, it probably won’t be at a level that will benefit from a few extra lines of resolution that the higher end cameras provide. Now if you are shooting content for theater, Blu-ray, visual effects, or high level clientele, then the higher end cameras should definitely be in your arsenal. 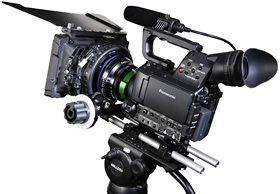 The AF100 comes in just south of $5k and the FS100 is expected to come in under $6k. For that price, you could get a 5D MkII, 7D and have money left over for a good tripod. Or you could take that extra money and invest it in some nice support gear like a stabilizer, jib, dolly, etc. We all know that good video isn’t reliant just on the quality of your camera. Even more so it is affected by the quality of your audio, lighting, tripod, etc. Of course, if you are tired of the limitations that the current lineup of HDSLRs have, these new cameras may be right up your alley. Not having to record audio separately, having proper monitoring options, controls that are optimized for video, reduced aliasing and rolling shutter are just a few of the benefits you will get. Plus you are working with a better codec and more lines of resolution. Overall, these cameras are designed to be professional tools and not require a lot of the hacks that were necessary with HDSLR shooting. The exciting part is that we are living in a new era: the democratization of filmmaking. High quality tools aren’t limited to Hollywood anymore. There is a tool at almost every price point. With whatever money you have in your pocket, you can invest in a camera that can capture beautiful images. At the end of the day you can nitpick specs all the way up to a RED Epic or Arri Alexa. Determine your budget and your application and start shooting! I’d have to say the Sony shouldn’t really even be in the conversation. With it’s price point, ONE card slot, No built in ND, etc. AF101 can be a great camera and is a more ‘all in one solution’ and can be used in ENG type environments. If you have time to set up shots and rigs. HDSLR with some nice lenses is still hard to beat. Plus you can start at a much lower point of entry and work your way up. I’ve been a DSLR shooter for about a year now and I’m seriously considering switching to the FS100. I shoot Sports (specifically CrossFit events) where all of my footage is run and gun, switching between indoors and outdoors, no time for tripods or follow focus. The biggest issue I’ve had is getting good audio and focusing. Recording audio separately with the zoom is a pain because there is no situation to use a clapper, an event starts and you’re off capturing it and then interviewing the athletes afterwards in sort of an interview-ambush fashion. Focus is tough because you’re constantly following athletes, moving to different angles, working on capturing the full movement and at the same time zooming in to get detail. I think moving to the FS100 will eliminate the focus/audio issues and allow me to show up and cover a crossfit event without much setup, thoughts? better and the Sony ‘shouldn’t even be in the conversation’. If it were that clear, I don’t think there would be as many people agonizing over the decision. They both have advantages and disadvantages over each other. Thank God that these companies have caught up. The DSLR revolution is over! I can finally get back to shooting quality video again. There’s one aspect that no one (interestingly) talks about. Which is the shooting time limit on DSLRs. A clip length on a 5D is 12 minutes. Let me repeat that: 12 minutes. That might be fine for many but I shoot interviews and I would like to likewise have the sensor look. But I couldn’t possibly tell a subject to stop talking because I’ve run out of room. The AF100 has two slots and with 32 or 64 gb cards, that’s a lot of shooting time. The FS100 has one slot but they make up for it buy offering outboard SSD options. So from the standpoint of having continuous shot options, both FS100 and AF100 have it over any DSLRs. However, the GH2 4/3rds does not have the aliasing and moire issues of the other DSLRs. I will wait until the next generation DSLRs come out to see what they have. While I no the lousy audio is a pain, the fact is it’s easily dealt with via independent audio. DSLR advantages are price entry. If they stay low, I can put up with the negatives, and I think only those that need to budget will use them for vid in the future. Jeez guys, STOP comparing DSLR with semipro camcorders! Their IQ is just bad – aliasing, moire, vertical resolution around 400 lines (ye, less then PAL). This is no good for serious amateur filmmaker. AF100 or FS100 has nothing of these troubles, their vertical resolution starts around 750, big DIFFERENCE!